At this Logan Square institution owner Tony Zarcone dispenses plenty of, yes, cones. He touts his soft-serve ice cream (vanilla, chocolate, twist) as being 96 percent fat free, and it might be a good idea to cut some calories considering the rest of the fare: quarter-pound burgers, cheese fries, funnel cakes, and a deep-fried Polish, an innovation Zarcone is particularly proud of. Friendly kids staff the counter, and a baby cone goes for about 70 cents. 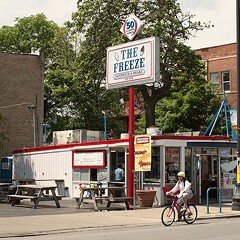 Logan Square is gentrifying fast, but everybody’s still welcome at the Freeze.